Filter by Standard Account Format Croft Ed. 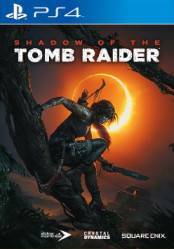 Attention: This version of Shadow of the Tomb Raider is for PS4 and depending on the store where you buy it you can come with some extras or others. This price list includes the Deluxe edition of the title, but not the Croft Edition. Don't forget that digital versions may have geographical restrictions on their activation, so check the specifications in each of the stores. There are no comments yet about Shadow of the Tomb Raider. You can be the first one!